Tbilisi’s Cardiological Institute, a single Soviet building without basic communications, sewage system, thermal insulation or elevator, is one among hundreds of abandoned city buildings which have been used as dwellings in recent years. While the Georgian state has limited its assistance to the people residing in these buildings to providing small amounts of firewood during winter, it has sought to restrict any attempts by Tbilisi’s squatters to improve their living conditions. Crucially, it has penalised them by abolishing subsistence allowances for poor households. The authorities believe the city’s homeless wish to legalise possession of occupied spaces, though squatters, on the whole, do not intend to do so. A week before Georgia’s parliamentary elections this month, Tbilisi city authorities announced some good news — an electricity hook-up for the people squatting in the Cardiological Institute. But whether the authorities try to employ the carrot or the stick, Georgia’s homeless remain unhoused. When I interviewed Nata a few months ago, she claimed that squatters would organise and attack the polling stations if the state didn’t find a solution to their housing problem. Their desperation is critical, but rather than perceiving it as a threat to public order, we should be alarmed by the lives of those approaching the fifth winter in a row as homeless. Treating homelessness or buying off social unrest? Since the early 1990s and the 2008 war with Russia, Georgia has had hundreds of thousands of internally displaced people and refugees. But there is more to Georgia’s homelessness problem than this. 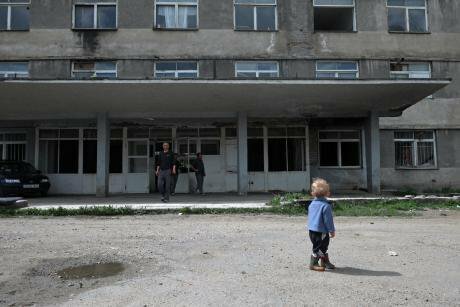 Special reports by Georgia’s Public Defender, as well as different publications by the Human Rights Education and Monitoring Center (EMC), point out that there are 401 squatted buildings in Tbilisi alone, with around 10,000 homeless families living in them. 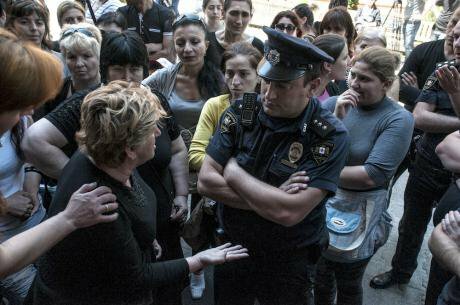 A police officers hears a complaint - the Georgian state isn't always so willing to listen. (c) Sopho Aptsiauri. All rights reserved.In addition, there are thousands of undocumented street dwellers and the so-called “hidden homeless” who are repressed by the state under the presumption (or rather, the myth) that these people are homeless voluntarily. It is also commonly believed that homeless are only a minority group or rural migrants who have a place to live in their home villages. By taking only repressive or only palliative measures towards Georgia’s homeless population, the state is, in effect, waging war against its neediest citizens and assisting them only with the purpose of “buying off” social unrest. Meanwhile, homelessness is being continuously reproduced in Tbilisi and elsewhere around Georgia on the structural, institutional or family level. Generally, homeless and poverty-stricken families in Georgia have two options, neither of them enviable — they can either squat in abandoned buildings or live on the streets. For people with disabilities, the elderly or children from foster care, the only alternative is to be admitted into a medical or residential care institution. Political discourse rarely takes into account the full range of guarantees concerning housing. For the authorities, homelessness is solely a manifestation of economic poverty or a reflection of Georgia’s low per capita incomes. What’s lost here is the understanding that homelessness isn’t just about ownership of space. In their understanding of housing as solely a material commodity for the homeless, the Georgian authorities overlook other pressing questions. This is their catch-all solution to a range of complex social problems, from political marginality to employment skills and social integration. Homelessness is a broader problem than many would admit. Crucially, it’s about social exclusion and barriers to access and stigma. Alongside low per capita incomes, this kind of marginality is a determining cause of homelessness, and continues to deny people social protection when they no longer have anywhere to live. Approaches to homelessness are hindered by a lack of detailed data. (c) Sopo Aptsiauri. All rights reserved.The European Typology on Homelessness and Housing Exclusion distinguishes seven theoretical categories of homelessness and housing exclusion. “Rooflessness” usually involves exclusion of all three domains (physical, legal and social). Unsurprisingly, it’s the most visible form of homelessness. But people living in insecure or inadequate housing, or who are otherwise socially isolated, tend to be classified as homeless groups. These people go unmentioned in Georgia’s public discussion on homelessness. To make matters worse, no statistical data is recorded about Georgia’s homeless, including those sleeping rough. As a result, there is no database to document people’s needs. The tendency to separate housing needs from other social factors can have unfortunate effects. Under the current system, special needs exclude people from housing assistance. Evidently, this is what determines homelessness in many cases, or excludes people from adequate housing. Thus, a homeless person with disabilities can’t be admitted to a night shelter in Georgia on the grounds that the shelter administration can’t provide appropriate care. On the other hand, Georgia’s social assistance mechanisms for people with special needs disregard the need for housing. The latter implies the risk of permanent segregation based on medical and care needs inside respective institutions, and limit these people’s opportunities to graduate from homelessness independently. The long way home. (c) Sopho Aptsiauri. All rights reserved.For example, psycho-social disorders among homeless persons can result in life inside medical institutions for an indefinite period of time. After being discharged from medical institutions, these persons are likely to end up in boarding houses for persons with disabilities or on the streets. As the boarding houses are closed institutions in remote rural or suburban areas, it rarely is a housing alternative. Housing conditions also determine access to social assistance, and rarely for the better. Living and sleeping rough in Tbilisi, for example, prevents people from being admitted to social assistance programmes. Regardless of being the neediest among poverty-stricken groups, the lack of a fixed dwelling prevents homeless persons from registering for and receiving benefits via Georgia’s state social assistance programs — whether universal or targeted. It is also a problem that unlike the groups who are excluded from housing assistances, people who “qualify” for housing services are constantly put at the risk of agreeing to graver exclusionary processes being imposed on them. Service beneficiaries are not encouraged towards transforming their disadvantaged positioning, growing and participating in development. Social programmes aimed at satisfying housing as only a material need (and disregard its social and legal dimensions) are counterproductive, and reduce the chances of transforming people’s housing conditions. These programmes produce services that are one-time or temporal and fail to be transitory assistances, and also bear the risks of entrenching inequalities, generating vulnerabilities, exploitation, marginalisation and under-representation itself. A pensioner sits in a Tbilisi squat, 2016. (c) Sopo Aptsiauri. All rights reserved.In December 2015, the Tbilisi municipality opened a modern facility for homeless people. At the same time, they demolished state-provisioned tents for the homeless located on Moscow Avenue in a city suburb. Unlike the unlimited and unregulated tent provisioning, Lilo Shelter, located in Didi Lilo district a few kilometres from the capital, represents an institutional housing service to homeless residents for 10 to 18 months. By relocating this new shelter away from the urban centre, the authorities prevented the people they were supposed to help from participating in the labour market. Additionally, by providing temporary refuge to individuals only, the Lilo Shelter programme contributes to the separation of families. Moreover, beneficiaries are eligible to become full-time residents of the shelter with the obligation to comply with the specific regulations of habitation there. This design discourages many chronic street dwellers from abandoning their livelihood strategies in exchange for temporary housing. Without providing guarantees on transitioning into different housing condition, there is a risk that a record of shelter residence will result in “ghettoisation” for some people, leading to stigmatisation and reducing their chances of graduating from poverty. 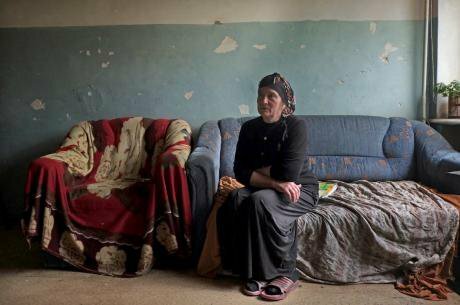 Long-term housing assistance schemes currently operating in Georgia are also blind to the need to eradicate social exclusion. 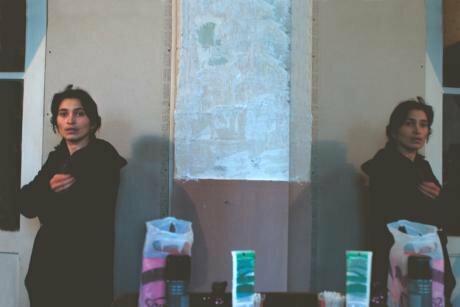 There have been municipal level monetary-assistance programmes that provide allowances to the poorest households in order to rent apartments in Tbilisi (in cases of natural disasters or extreme poverty) and buy them in cases of conflict-related displacement. But unluckily for the beneficiaries, rent assistance ceases when the financial resources expire, as if they were donations and families were not fully dependent on it. Municipalities have no records of homeless people’s needs or capabilities and can’t claim that the discharge of beneficiaries from the programme happens on the grounds of targeting the neediest or accessing housing condition of its beneficiaries. What is worse, in case of both type of the assistances, the amount of monetary allowances are fixed, small and not determined by the size of the household, or its needs. This is a challenge when the beneficiary is responsible for finding housing on the real estate market where prices change. That is why many of the recipients have ended up satisfying household consumable needs, rather than using the money for housing. Essentially, Georgia’s housing assistance to its homeless population consists of alleviation programmes. These are conceived as temporary measures — the presumption is that beneficiaries’ need for them will diminish over time. But autarky and autonomy are very different things. The more we assume that homeless persons are self-sufficient in escaping homelessness, the more we will continue to ignore how homelessness is embedded in social and legal processes in Georgia and beyond. “Once the elections are over,” concludes Nata, “politicians hibernate like bears in their dens.” Meanwhile, she and her fellow squatters continue their struggle for recognition. We are grateful to Sopho Aptsiauri for permission to use these images. 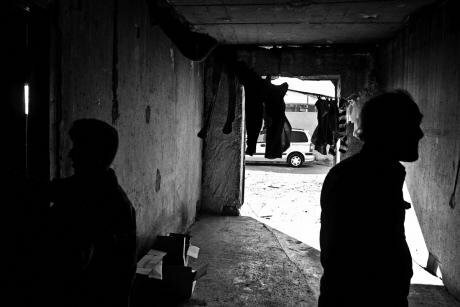 This month, EMC Tbilisi releases its report "Homelessness: an analysis of state policies". Contact the centre or the author for more details.